The Physician Assistant Exam will expect you to understand that many different kinds of blocks can occur along the cardiac conduction system, from the sinus node to the AV node to the bundle of Purkinje fibers. Here you read about the different blocks of the conduction system and how to evaluate them. First-degree AV block is fairly simple. The normal PR interval is <= 200 milliseconds (0.2 seconds). In a first-degree AV block, the PR interval is longer than that. It’s fixed; it doesn’t vary or change. Causes can include medications like beta blockers or medical conditions that can affect conduction of the sinus node, such as an aortic valve abscess. Take a look at a strip showing a first-degree AV block. You can divide the second-degree AV block into two types — Type I and Type II. With this block, the focus is again on the PR interval. Below is an example of a Type I second-degree AV block. Think of Type I (also called Wenckebach) as a PR interval that’s like Pinocchio’s nose: With each beat, the PR interval gets longer and longer, before you lose a QRS complex. Then the cycle repeats itself. Type I has a pretty benign prognosis, and it’s usually just watched closely. The Type II second-degree AV block (Mobitz Type II) is a baddie. It has some serious implications. Below is an example of a Mobitz Type II AV block. With Mobitz Type II, the PR interval is fixed, but not all the P waves conduct to the ventricle. Thus, you can see some dropped QRS complexes. The atrial conduction is okay, so your P-to-P intervals are fine. If the atria aren’t able to conduct to the ventricle, you get a P wave but not a corresponding QRS complex. A big point about this conduction disturbance is that it can be a warning sign of impending transition to third-degree (complete) heart block and so is an indication for a pacemaker, especially if a lot of QRS complexes are being dropped. With a third-degree AV block, the P wave isn’t being conducted to the QRS. The atria and the ventricles are kind of doing their own thing. This is an indication for a pacemaker. Here is an example of a third-degree AV block. Sinus bradycardia can be symptomatic or asymptomatic. For example, some athletes can have resting pulses in the high 50 BPM range to the low 40 BPM range, and that’s symptomatic of nothing except being in great shape. But in many people, the bradycardia is symptomatic. Common causes of sinus bradycardia include medications like beta blockers and calcium channel blockers. Causes can also include electrolyte abnormalities, including hyperkalemia, and ischemia to the area. The affected person can feel dizzy, weak, or lightheaded, or even experience a syncopal or near-syncopal episode. Treatments can involve evaluating and treating the abnormal electrolytes and discontinuing the offending medications. In some cases, a pacemaker may be needed. Sick sinus syndrome can cause long symptomatic sinus bradycardia and can cause long sinus pauses. It can also be part of a condition called tachy-brady syndrome. Sick sinus syndrome can be an indication for a pacemaker. For the PANCE, know your right and left bundle branch blocks. Be able to diagnose them and be aware of the important causes of each one. You can see right bundle branch blocks (RBBBs) when you look at leads V1 to V4 on an ECG. You see a big-time R wave in these leads, as compared to an S wave. You can also see what looks like rabbit ears in the leads. In addition, you see widening of the QRS wave, and the T wave is in the opposite deflection to the R wave. This means if the R wave is up, the T is down. Common causes of right bundle branch blocks include a pulmonary embolus or pulmonary hypertension. Most of the time, there’s no treatment for a right bundle branch block except evaluating and treating the underlying cause. 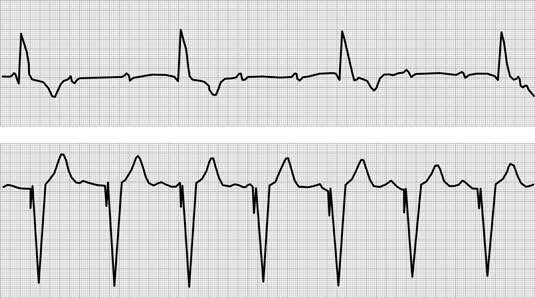 Left bundle branch blocks (LBBB) can be old or new. If you see a new left bundle branch block, you need to worry that an ischemic event (STEMI) affecting the left ventricle has occurred. A cardiac catherization may need to be done to evaluate the coronary artery anatomy. Below you will see an example of a left bundle branch block. On an ECG, you focus primarily on leads V5 and V6. You see a broad notched or slurred R wave in leads I, aVL, V5, and V6 and a widened QRS greater than three blocks. Patients with a left bundle branch block require complete cardiac evaluation, and those with a left bundle branch block and syncope or near-syncope may require a pacemaker. Some patients with a left bundle branch block, a markedly prolonged QRS, and congestive heart failure may benefit from a pacemaker, which provides rapid left ventricular contractions.